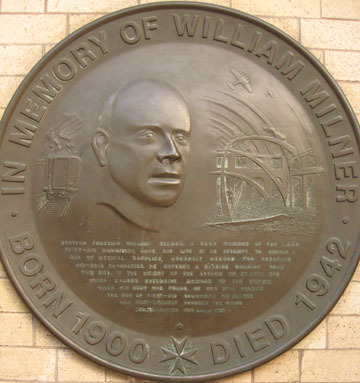 Station Foreman William Milner, a keen member of the LNER First-Aid Movement, gave his life in an attempt to obtain a box of medical supplies, urgently needed for treating air-raid casualties. He entered a blazing building near this site at the height of the attack on 29 April 1942 which caused extensive damage to the station. When his body was found, he was still holding the box of first-aid equipment. Mr Milner was posthumously awarded the King’s Commendation for Gallantry. This memorial at York railway station is a reminder of the night of the ‘Baedeker raid‘ on York. William Milner’s name is included on the casualty list for that night. In the nearby railway museum (NRM) there’s a floor plaque recording the site where another of the bombs fell on 29 April 1942.